I ate a total of 8 of these last week (for the purpose of research, of course) and I can tell you from my experience that these are some puzzling muffins. When they came out of the oven, I bit into one while they were still warm. Upon that bite, I didn’t have much love for them. They were a bit drier than I had hoped but a little butter made them okay. I was almost ready to dismiss and toss them, but I felt bad being so wasteful and opted to hold onto them instead with the hope that they might get a little better the next day, as some baked goods do. I was happy to find that they did indeed taste a little better the next day. The day after that, they tasted pretty darn good and by the next, to my surprise, I actually came to crave them. They became more moist, more dense and tasted more like the peanut butter cookie / muffin hybrid I was hoping for. 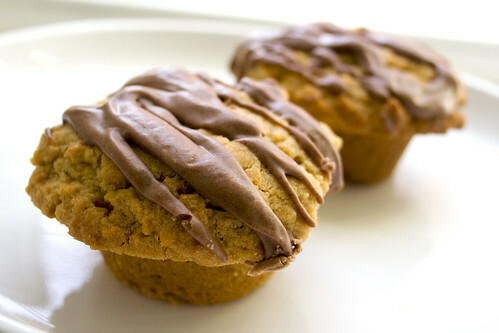 Before these, the closest I had found to a great peanut butter muffin was Elinor Klivan’s Peanut Butter Cupcakes which are pretty rich and probably not meant for breakfast. I was looking for something that walks the fine line of hearty breakfast treat with just a touch of indulgence. I just may have found what I was looking for. The progress that this muffin made seemed so strange to me. I went from almost wanting to chuck them one day to devouring every last morsel a few days later. So basically I’m recommending that you bake these but wait 2 days to eat them. :-P Of course, one great thing about the 2 day waiting period is that if you’re planning a brunch or something, you can make them way ahead (making your day-of prep much lighter) and they will taste awesome! I recommend that you take advantage of this little wonder and bake up a batch. Some notes on the recipe: At first taste, I was also ready to dismiss the chocolate drizzle, but that grew on me as well. It’s a bit sweet for breakfast, but lightens this somewhat heavy* muffin. I altered it slightly by adding more cocoa (see the adjusted recipe after the break). I lightly greased my muffin tin and the muffins came out easily, so you can save your paper wrappers for your next batch of cupcakes. I didn’t realize that the recipe was intended for 16 muffins and instead piled the stiff batter into a 12-muffin tin. The tops spread nicely, but not too much and baked slightly longer than the instructed baking time. 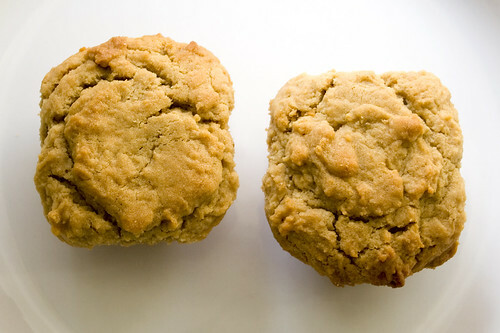 I also enjoyed that they look like cookies from the top, so when you take them out of the oven when the bottoms are concealed in the mold, they appear to be a batch of peanut butter cookies instead of muffins. From its appearance to its taste, this recipe was a bit of a puzzler, but in a good way. I hope you enjoy! *That word seems to offer a bad connotation, but they are heavy in a hearty way. 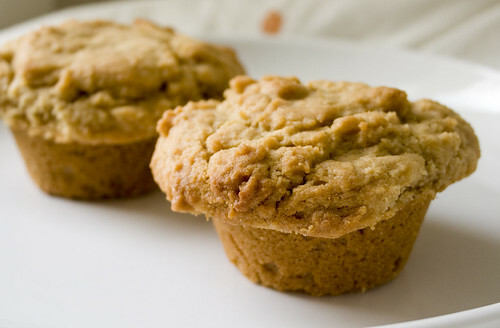 With 2 cups of peanut butter in the batter, they will keep you full til lunch! Slightly adjusted recipe after the break. 1. Preheat oven to 350°F. Lightly grease 16 medium muffin cups or line with paper baking cups; set aside. 2. In large mixing bowl, combine flour, baking soda and salt. 3. In another large mixing bowl, cream butter, peanut butter and sugar. Add eggs and gradually add milk and combine well. 4. Add dry ingredients to peanut butter mixture and mix with a wooden spoon until dry ingredients are moistened. Mixture will be stiff. 5. Spoon batter into each muffin cup, filling cup. Bake 15-20 minutes or until lightly browned. Cool in muffin cups on wire rack for 5 minutes. Remove; cool completely. Frost with Chocolate Glaze, if desired. Chocolate Glaze: Add 1/4 cup + 2 Tbsp unsweetened cocoa powder to 2 cups Domino Confectioners Sugar, 2 tablespoons softened butter or margarine and 1 1/2 tablespoons milk. Add more milk, a teaspoon at a time, until mixture is desired consistency for spreading.